Comet 67P/Churyumov-Gerasimenko as seen by the Rosetta mission on Nov. 4, 2014. The European Space Agency is going to attempt to land a probe on the surface of a comet next week. If successful, the soft-landing will be the first of its kind in history. The Rosetta probe is expected to release its Philae lander down to the surface of Comet 67P/Churyumov-Gerasimenko on Wednesday (Nov. 12). Officials on Earth won't know if Philae survived its difficult journey to its landing site (named Agilkia) for about seven hours after the probe is released from Rosetta. Scientists are hoping that Rosetta and Philae will be able to answer some burning questions they have about the icy comets in the solar system. You can watch coverage of the comet landing live on Space.com. The European Space Agency and NASA will host webcasts on Tuesday afternoon through Wednesday after officials on Earth have confirmation of the lander's successful touchdown on Comet 67P/C-G.
Rosetta and Philae launched to space in 2004. It took them about 10 years to meet up with Comet 67P/C-G, arriving at the comet in August. Once it touches down on the comet's surface, Philae will release a harpoon that should keep it in place on its landing spot. Philae will carry 10 instruments down to the surface of the comet. The science tools are designed to take photos, analyze the molecular composition of the comet, drill into the cosmic body, and perform other experiments. Rosetta has 11 instruments onboard. "After touchdown on Nov. 12, the Philae lander will obtain the first images ever taken from a comet's surface. 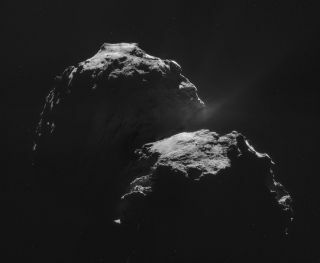 It will also drill into the surface to study the composition, and witness close up how a comet changes as its exposure to the sun varies," NASA officials said of Rosetta in a statement. Philae gets its name from an obelisk found on an island in the Nile River, and Rosetta is named for the Rosetta Stone — a tablet that helped archaeologists translate ancient Egyptian hieroglyphics. Rosetta should continue orbiting the comet through the object's closest approach to the sun in August 2015. This timing will give scientists an opportunity to see how the comet changes as it gets closer to the star and begins to heat up.